Lubricating oil additives (LOAs) are used to enhance the performance of lubricants and functional fluids. Each additive is selected for its ability to perform one or more specific functions in combination with other additives. Selected additives are formulated into packages for use with a specific lubricant base stock and for a specified end-use application. The largest end use is in automotive engine crankcase lubricants. Other automotive applications include hydraulic fluids and gear oils. In addition, many industrial lubricants and metalworking oils also contain LOAs. The major functional additive types are dispersants, detergents, oxidation inhibitors, antiwear agents, extreme-pressure additives, and viscosity index improvers. The oil price decline since the second half of 2014 has had a significant impact on the prices of base oil and single additives. Single additives prices dropped by 15–20% in 2015 compared with 2014. However, the DI package prices were little affected because the cost of the additive package is a large part of the test fee. Although crude oil prices were fluctuating at a low level during 2015–18, LOA prices were stable. Government regulations have had a major impact on the LOA business in the past and are likely to remain important in the future, as upgrading lubricants is part of the effort to improve fuel economy and to meet more stringent emission-control requirements. The LOA business is dominated by four multinational companies, some of which are or were linked to major oil companies. Together, they account for over 85–90% of the market. These four suppliers offer packages of formulated components, most of which they captively manufacture. Three are headquartered in the United States, where a large share of the manufacturing is conducted. Thus, the United States is a large net exporter of LOAs to other world areas. Japan in contrast imports most of its products. The four large additive companies have all set up manufacturing plants in Singapore, from where they supply additives mainly for the Asian market including China. As a result, Singapore has become an important exporter of lubricating oil additives. The end-user market is highly competitive, lacking in product differentiation, and also characterized by customer consolidation, leading to fewer and more highly leveraged customers that have greater bargaining power. Lubricants are used for various machines. Advances in machinery are the major driver for lubricant upgrades. Overall, lubricating oil additives are consumed primarily in auto vehicle lubricants, with a share of around 70% or more of the total additives consumption. The auto vehicle industry has become important for LOA technology and markets. Greenhouse gas (GHG) control is the key factor impacting the auto vehicle industry, including mandated regulations on fuel economy and emission control. It is expected that mandated regulations will speed up GHG control in the next 5 or 10 years. Most countries’ governments have also made related regional mandated regulations. 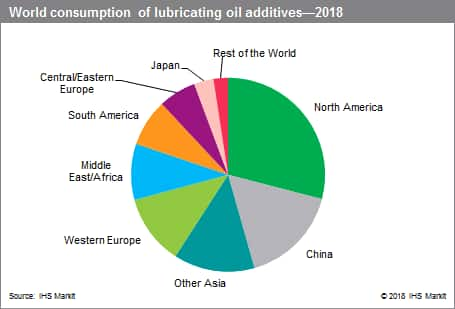 The split between demand for lubricants (the end-use market for LOAs) in the automotive and industrial sectors varies widely across the world. Lube oil for automotive applications depends on automotive production as well as on automotive possession. In some Asian countries, especially in India, Indonesia, and Thailand, lube oil for motorcycles plays an important role because of high motorcycle production and possession in these countries. For industrial uses, economic development and industrialization usually result in lube oil consumption growth. The LOA market share for the automotive vehicles sector has dropped as a result of lengthened lube oil exchange intervals. The overall global LOA demand growth rate has been slowing, along with lubricant demand. The best growth opportunities are in the rapidly growing Asia Pacific market—especially China, India, and the ASEAN countries, although the growth rates are not very high, at around 3.3–3.7%. Based on improvements in political and economic stability, growth should also be better in Central and Eastern Europe, including the countries of the former USSR. Brazil is leading the growth in South America. Companies that are well established in these locations are in the strongest position to take advantage of these opportunities. Growth rates for the LOA business in the developed world, where the market is highly mature, will remain minimal. The most important considerations in the most economically developed regions are the changing technology in the end-use industries (e.g., automotive engine design), government regulations (e.g., lower emissions and lower fuel consumption), and the need to provide the attributes the end-use industries or lubricant manufacturers wish to promote in their marketing strategies (e.g., longer drain intervals and lower maintenance costs). The global LOA market volume is expected to grow at an average rate of 1.3% from 2018 to 2023. Both market volume and value rose from 2015 to 2018, but the growth rate was very low along with the slowdown in lubricating oil demand.